Be a Hawaii House Hunter and Get Paid for Finding Hidden Deals! Aloha! Do you know someone who needs to sell their house on Oahu, fast and easy? Maybe someone behind in their payments? 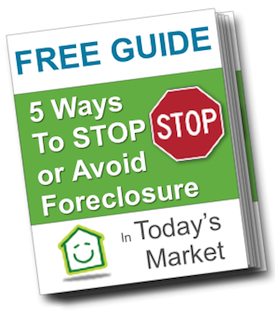 Is trying to avoid foreclosure? Maybe someone who lost their job? Is relocating? Inherited a house they don’t want to keep? Can’t afford the big repairs? Maybe you know of a vacant property in your neighborhood that you think would be great as our next big project. You see, all our marketing in the world won’t reach 95% of the people you know — people who may need our help. This means that without your help connecting us, these people will continue to fall on hard times. We’d like to change that and see if they’d like to sell their house to us “as is” for some fast cash! And here’s the real kicker — if we buy the house, WE’LL PAY YOU $1000 OR MORE! Here’s what you need to do: find good deals. That’s it! We buy houses here on Oahu and we’re looking to buy more. 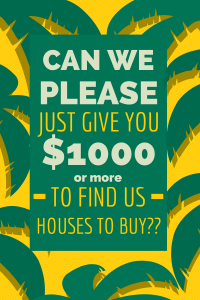 If you connect us with a “motivated seller” (more on that in a minute) and we end up buying the house, we’ll pay you $1000, maybe more. We could go on, but you get the idea. Now the question is: How do I find these people so I can get paid $1000 or more? Well, you could start by asking your friends and family. You could also drive around Oahu and write down addresses of homes that appear vacant. There are tons of things you can do — the key idea is that the person must be “motivated”. In other words, they have an extra reason why they must sell. The house must not be publicly listed on the MLS. We are looking for hidden, “off market” properties only. Motivated sellers or vacant properties only! You will get paid separately before closing. There is no profit sharing or commission of any type. Your fee is a marketing fee for finding us a deal. Do you have a property or seller in mind already? GREAT! Just fill out the form below and bookmark this page to use for your next one. The more potential deals you submit, the more likely you’re going to get that $1000+ payday! Shall We Keep Your Information Private? Let us know if you want us to keep your name a secret when contacting them. Help us control spam and fill in this form before proceeding.